After listening to the news, I realize this isn't a major world problem!! However, I wondered what you all think: I had these charm squares (left over from previous project and some added) and wanted to make the D4P. The top picture is without sashing. I decided I wanted to add sashing the width of the "stripes" in the center of each block. I used to be blonde so will blame that! I measured (and promptly forgot or something) and the finished sashing is 1/4 inch narrower than the stripes. I have already added several before I re-measured and found oops! and wouldn't have enough material to make wider, not to mention the ripping. Do you think it looks out of proportion or that it needs to be removed entirely or that it needs to be another color? Then the setting triangles. I don't probably have enough of the burgundy, plus it would make it dark, but think for continuity it needs to be the same? I have the flowered material and enough, or I have cream and enough. Thoughts??? I am always interested in what I read and try to learn something from it. Thanks. I think your sashing looks beautiful. Since it is narrower, it is more subtle, which puts the focus more on the squares. I wouldn't change a thing. I agree. What a design opportunity! The most important question is, "Do you like it?" 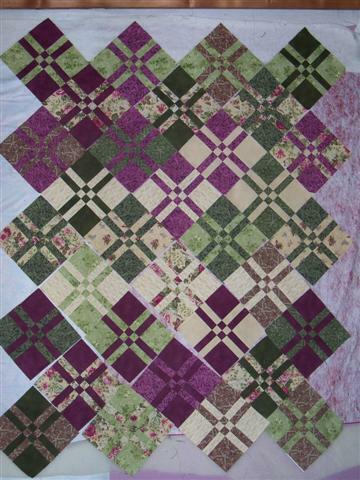 If you also sash the outside of all the blocks, then I think the floral would be pretty for the setting squares. I love the sashing. I'd use the flowered material for the setting squares. It'd lovely. I like the sashing and thought so before I even read your post. I certainly didn't notice it being "off" in any way. Keep going and enjoy your quilt. I agree with all of the above. Sashing looks good. Just a nice design. I love the narrow sashing, I wouldn't change it! I would use the flowery fabric too for the setting triangles. Really like the sashing. The whole pattern is really striking. I might be tempted to use one of the near solids from the blocks, not the sashing color though. Well, as usual, I guess I'm the dissenting voice, ! I would leave off the sashing *because* setting the blocks side-by-side creates a minor secondary pattern that gives the eye yet another design to look at. Sashing stops the action every time, in my opinion. The colors are great and I like the top picture a lot. i like the narrower sashing because it makes your blocks stand out more. I agree, it will be gorgeous with the sashing and floral setting squares!!! Beautiful - love the sashing. It truly looks beautiful! Keep the narrow sashing - like someone says it helps draw your attention to the squares. Again, what a beautiful quilt! I would only use the sashing if you are going to completely frame each block with it. The width is perfect though! Either the floral or the cream would my choice for the setting triangles. LOVE your quilt, the sashing and your setting idea. Great work! I am with Jan on this one. Well, I have had all the thoughts that have been expressed. I may use this for a raffle quilt for a person who has had an accident and I wanted it to be nice. When I had the size sashing (auditioning) between the blocks, it formed a really neat secondary pattern which made the four-patch appear as a cornerstone on the outside of the new block (visual only). Then I cut them wrong and doggoned it, it changed the whole secondary thing. I thought it made the block the focus as well and decided well, maybe it would work. But then I wanted it to be really nice and I didn't want people to think "what in the world?" So that is when I went to you experts. I had neatly squared every single block and cut each sash individually so it would be nice and straight and just the right width. Guess my mind went on vacation. I didn't want to rip everythng because no matter how carefully, I think a bit of distortion can occur. Then I decided I had to sash the outer blocks if I was going to do it that way. So I am thinking that I will proceed, sash the outer blocks, audition the floral and give it a go. Any ideas for borders??? I thought of piano keys, if I could scrape enough fabric together. Have never done those. Currently it is about 70 by 80. If anyone has any other thoughts, I would love to hear them. I appreciate your comments taking the time to "talk" to me. Jan and Peckish and Lori, I think I will opt for the easier way out this time, but I value your opinions. The funny thing is that I started a quilt for my granddaughter and it was driving me crazy to match all the 36 diamonds in the big diamond, so thought I would whip this one out easy peasy. Then this happened!! I just need to get a pattern, follow it and do what it tells me instead of trying to be original (kind of). NO, no, Quilter 65!! Keep "being original", you'll get better at it as time goes on. Just remember, a mistake is merely a design opportunity. Not a crisis. Are you kidding? Originality rules! You're doing great. Keep it up. And design changes are normal when doing an original. Think about all of the great artists through history who painted a "series" of similar paintings. They were honing their skills. Once again, Jan, you offer up more than just quilting wisdom! It would be interesting to find out how many inventions and new ideas were created and/or perfected because of errors along the design route! "Oops" moments often become "Ah ha!" moments! 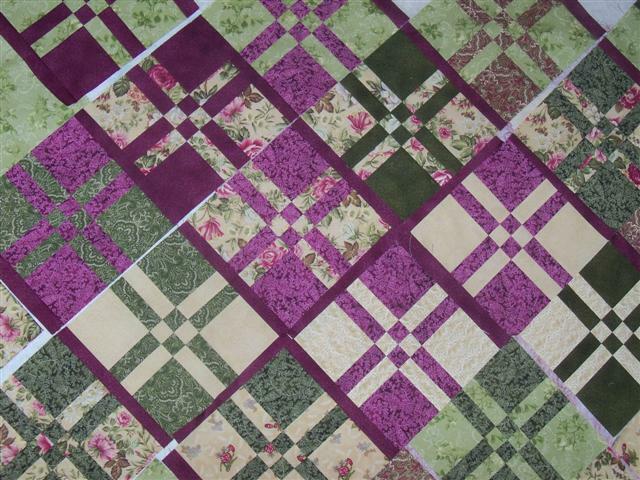 I like the quilt without the sashing, but it's also pretty with it. I think I would use cream setting triangles, and cut them bigger so that when you trim the edges go from corner to corner. But trim at one half inch, not one fourth inch. Then when you make 1/4 inch seam on the borders, your quilt will "float" Also that way you NEVER cut off points! ! ! I love piano keys. I have made too many of them. And your quilt really could use the little extra size.